As we read how the mayor of Venice defended one piazza San Marco restaurant’s charging of 500 Euro for lunch to an unwitting tourist, we were again reminded why we loved basing our Veneto Extension in nearby Padua. Walking Padua is charming, welcoming, and an affordable option to the beautiful but pricey Venice. Padua is an engaging, mid-sized university town located a well-serviced 30 minute train ride from Venice. The oldest city in Northern Italy, its centro historico holds an array of beautiful and well preserved architecture. Walking Padua is easy. 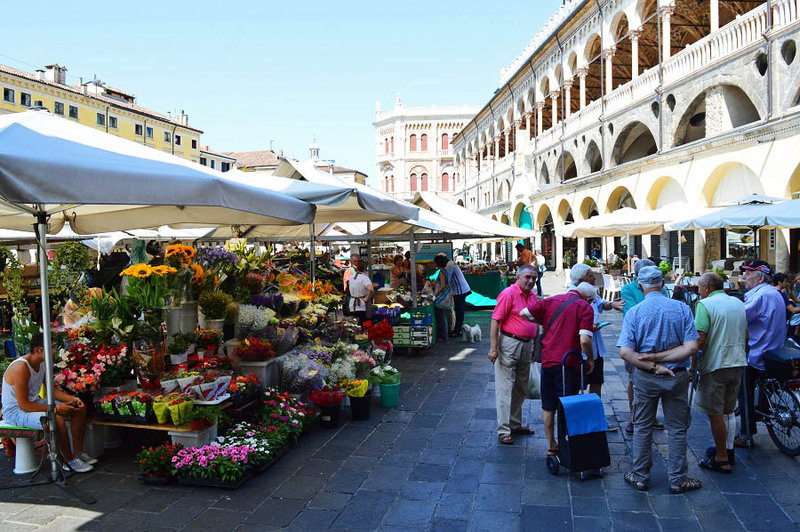 It is a city filled with art, music, great food, and shopping, Padua is a wonderful place to visit all on its own. Even better, it is a great base to explore the surrounding region of Veneto. We arrived to the Padua train station on a chilly November afternoon. Grey clouds foretold of impending showers. To say we had tried it, with our mid-sized luggage we walked the 20 minutes to our hotel in the historic center. The walk with our roll-aways was flat and completely manageable, but not something we will likely do again. The tram and bus system makes catching a ride into the centro historico an easy business. Also, the cobbled streets are rough on the luggage wheels, even quality ones. The arrival to our the Hotel Majestic Toscanelli was warm and welcoming. We checked into our room and put on extra layers to stave off the cold. Then struck out to find a bite to eat. As often happens when we’re on the road, it was too late for lunch, too early for dinner, and we were hungry. 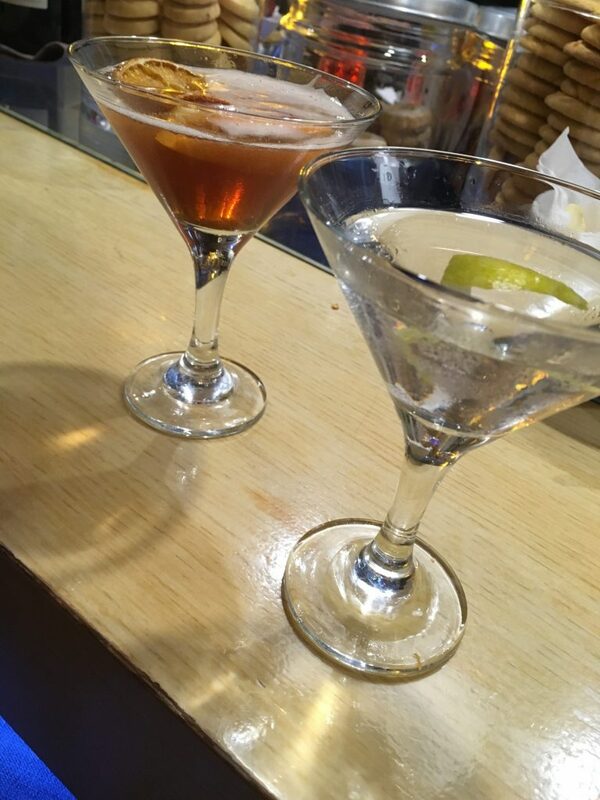 Fortunately, we did fall into the grace period of aperitivo, what we’d call “happy hour” in the States. Starting around 5:00pm bars begin to open for drinks and small bites while the restaurants remain firmly “chiuso” until 7:00pm at the earliest. We found ourselves in the lively Les Tulipes. The sleek bar and ambient lighting made the small room of chatting tables feel both homey and hip. We confirmed with our bartender he could make “cocktails american” and ordered up our usual: a Manhattan and a gin martini. They arrived beautifully presented a few minutes later. We snacked on chips and sipped our beverages while planning out our next day’s adventures. When the dinner hour rolled around we made our way into the evening. We strolled through the centro to the other side of the Adige – the river that runs through Padua. 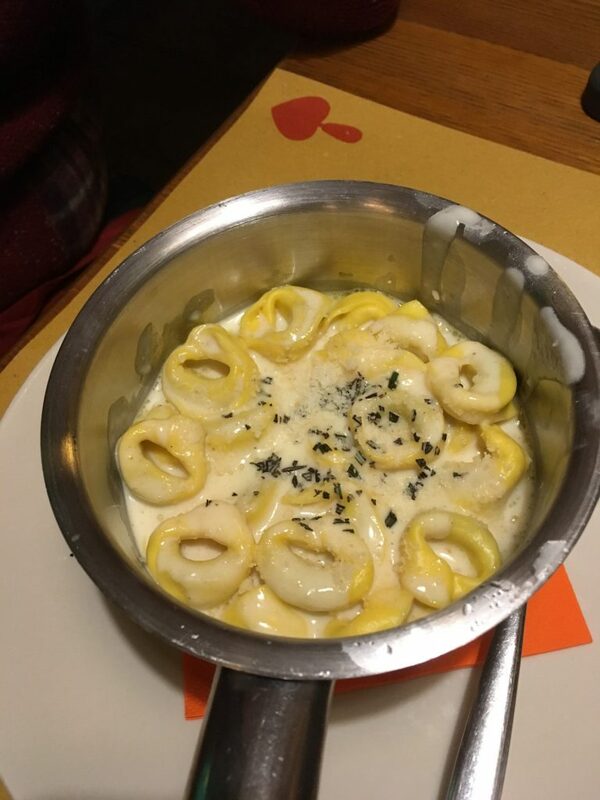 We couldn’t find the place recommended to us and ended up at Antonio Ferrari restaurant where we tried the polenta with grilled octopus and tortelli. Both were very good. The next morning we made our own roaming tour walking Padua at a leisurely pace. The historic center is very well preserved. Its ancient cobbled streets are lined with interesting and beautiful architecture. Each narrow, winding street opens to some piazza. They can be small, intimate affairs, perhaps accented with a few tables from the resident bar. Or you may find one grand, public space after another. It was a treat to move from Piazzas del’Erbe to Signore to Duomo all within a few blocks. We also spent some time exploring the University of Padua, which is the second oldest university in Italy, founded in 1222. It still houses the oldest surviving permanent anatomical theatre in Europe, dating from 1595. In the afternoon we decided to treat ourselves to a little spa time. Google Maps led us to Moon Night Spa on the West side of the Adige. While not quite luxury, the space exuded a relaxing zen vibe. Roberta, the owner, fixed us up with a sauna session that was just right to ward off the chill of the day. Our final morning in Padua we set out early to get some pictures of the city in the morning light. At 8am the open air markets in the piazzas were already bustling. The streets were busy with shoppers, students, and commuters. After a quick caffè we collected our bags and covered the quick four blocks to the tram stop and then the train station headed for our next destination. 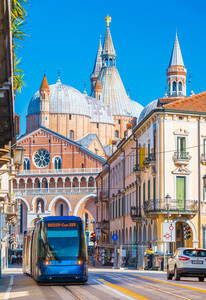 After visiting the Italian Riviera and Lake Como, on our Blue Walk Italy walking tours, we spend three nights in Padua. From Padua we visit stunning Venice and romantic Verona. If you’d like more information please see our tour page or contact us directly.